Forget Paris-brest – here are Guillaume Brahimi's Paris bests. The Australia-based French chef behind Bistro Guillaume grew up between Paris-proper and Versailles, and returns to visit his parents and partner four times a year. 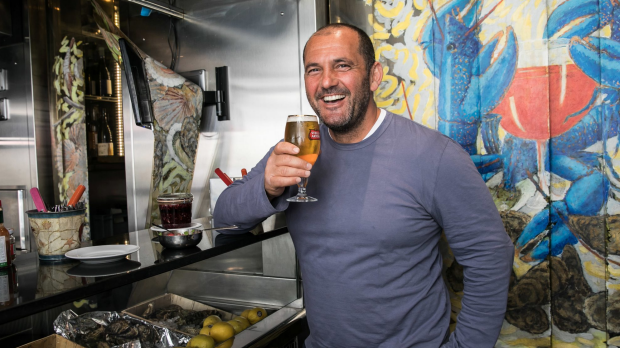 He was recently in Paris to collaborate with celeb-magnet chef Jean Imbert for a special Stella Artois Sensorium dinner at hotspot L'Acajou, and shared his favourite haunts during an informal tour with Good Food. "I just love the terrace of Le Comptoir. It's very hard to beat on a sunny day with a nice glass of white wine – you're in trouble." The corner restaurant on a wedge-shaped Saint-Germain intersection is run by his good friend, chef Yves Camdeborde. Camdeborde applies bistronomy techniques to bistro classics. "Yves is not shy to use ginger, coriander – things they don't use in France," says Brahimi. Camdeborde is taking over the street, with a hotel and side-by-side spin-off bars dedicated to seafood (L'Avant Comptoir de la Mer) and charcuterie (L'Avant Comptoir de la Terre; look for the ceramic pig). Streetside at de la Mer, oysters are shucked to order by men in Breton-striped shirts; enter through plastic door flaps painted with a blue crab clutching a glass of red, into a narrow bar with tapas-style menu cards hanging from the ceiling. A mountain of butter and large jars of mignonette dressing sit in readiness on the zinc bartop. Brahimi orders a dozen oysters, which are presented with a centrepiece of pork sausages. He instructs us to down an oyster, take a bite of thickly buttered bread, eat a pork sausage and wash it down with a beer or wine. Praise for Ble Sucre's pain au chocolat is plastered on the window, but Brahimi can't go past the bakery's plain pastry. 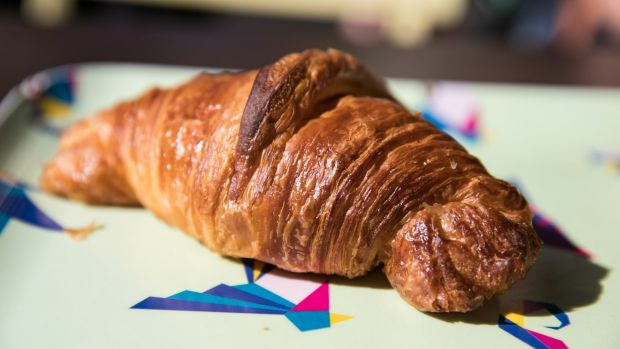 The fresh-out-of-the-oven croissant's crunchy layers flake away to reveal a still-warm, buttery interior – it leaves just the right amount of grease on the fingertips. Contend with locals and their French bulldogs for one of the outside tables, or enjoy your pastries in the garden and playground opposite. 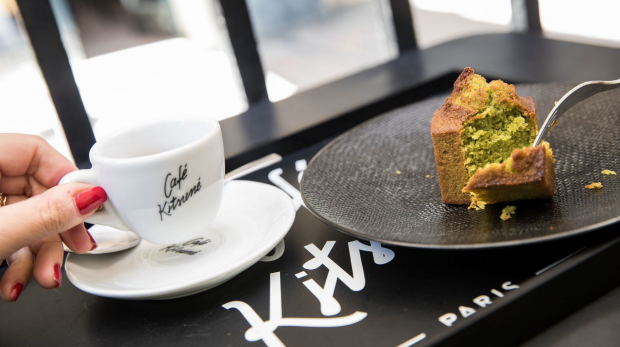 Cafe Kitsune, an offshoot of French fashion label Maison Kitsune, oozes style, from its staff to its clientele. The narrow shopfront on the edge of the Palais Royal even has its own designer merchandise. Brahimi resists the counter's petite treats ("They're just too dangerous – I know what you put in a financier") and orders a double macchiato. But you can always join the joggers in a post-coffee lap of the palace gardens, to work off said puffed square-shaped matcha and almond financier. 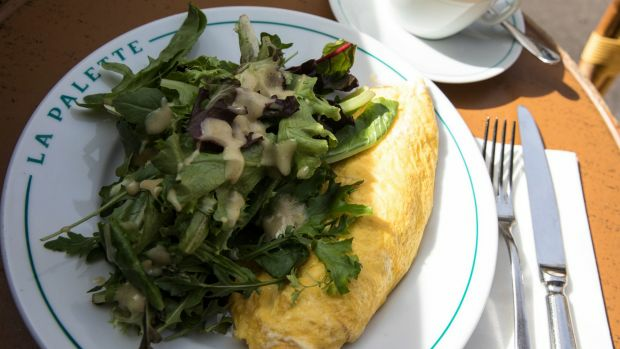 At La Palette, a corner cafe with awnings and greenery, Brahimi opts for a simple three-egg omelette with ham, gruyere cheese and a little parsley. If you nab an outside seat, settle in. "People stay there forever because it's a great scene looking at people, there's always some writers and movie people. It's very Parisian, very Left Bank," says Brahimi. Note: On Sundays you'll be hard pressed to find an early brunch; Parisians tend to enjoy takeaway croissants as breakfast in bed instead. Cyril Lignac's eponymous pastry counters are stocked with a tightly edited selection of tarts of symmetric precision. 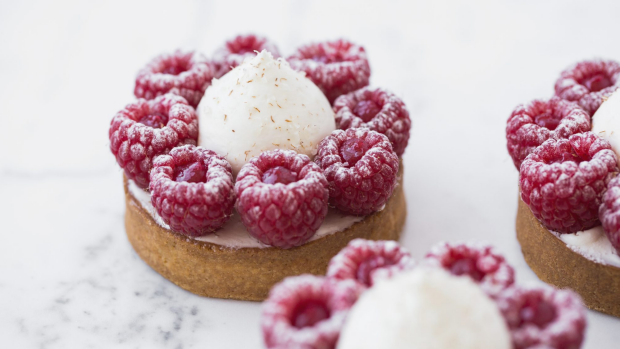 Skip the cute chocolate coated marshmallow bears, because, according to Brahimi: "You need to try his raspberry tart. He's got a very funny way to put a raspberry – he puts them upside down. That's a trademark of his." The inverted berries are filled with a raspberry coulis and arranged as a halo. Brahimi is a big fan of the boozy baba au rhum (rum baba) topped with whipped cream, which is a hit at dinner parties. Spoiler: you won't find Paris mash in Paris itself. Brahimi came up with the name – a riff on gossip magazine Paris Match – upon his arrival in Australia. You can try the original at L'Atelier de Joel Robuchon, where Brahimi learnt his now-signature mashed potato method. 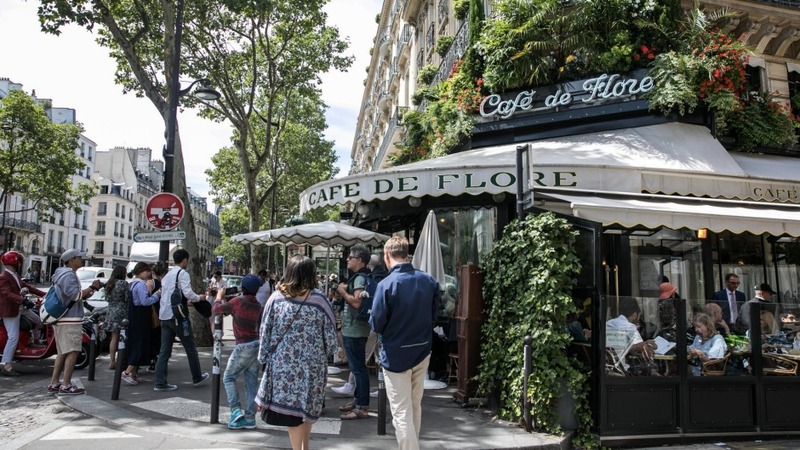 Cafe de Flore is so popular, it's almost a cliche. It's certainly a scene to be seen at. For Brahimi, the corner cafe on a bustling boulevard is the centre of Paris, a place where he enjoys spending a couple of hours picking at a plate of saucisson and watching the world go by. The all-day menu might be confusing to tourists; here are a few of his go-to orders: "It doesn't matter the time, there's always something to drink or something to eat, whether it is a croissant and egg cocotte in the morning, to a big salad for lunch, to the tartine – bread with very fine smoked salmon – and a glass of Chablis." 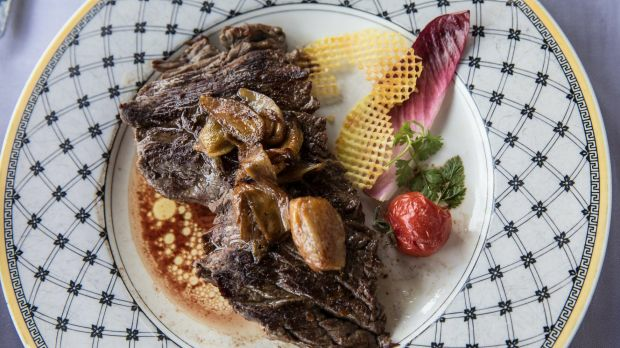 At Voltaire, Brahimi orders the bavette aux eschalots, medium-rare. The skirt steak, with satisfying chew factor, comes with golden fries, shallots cooked to submission and a dish of buttered zucchini ("They call that a 'healthy' vegetable," says Brahimi). The old-school brasserie's interior is as you'd expect: dark wood panelling, brassy art deco chevron dividers and emerald velvet banquettes. "I love the waiters, they've been there for 100 years; they can be charming as much as they can be French, if you know what I mean." Voltaire's location makes up for any brusque service – right on the river bank, diagonally opposite the Louvre, and merely 100 metres from the Musee d'Orsay – perfect for a lunch break between culture hits. Could this be Paris' most gourmet pocket? Brahimi and his partner head for Rue du Nil, a short street in the second arrondissement, to do their food shop. Gregory Marchand, the chef behind the strip's popular Frenchie-branded restaurant, wine bar and takeaway, convinced his suppliers to open neighbouring shopfronts, with the street boasting a butcher, fishmonger and greengrocer under the Terroirs d'Avenir banner. Another epicurean favourite is La Grande Epicerie, tucked into a corner of department store Le Bon Marche, which Brahimi describes as being "like Simon Johnson, on steroids"; its shelves are stocked with fleur de sel, mustards, salted caramel bonbons, sable biscuits and more. If you want to go to marche, to marche, Brahimi's traditional open-air market pick is Marche Raspail (open Tuesdays and Fridays; Sundays for organic produce only). Annabel Smith travelled to Paris as a guest of Stella Artois. Stay tuned for more Sensorium dinners around Australia, featuring local chefs Adam D'Sylva, Scott Pickett, Darren Robertson and Colin Fassnidge.